Some coverage on PAH's developed outside of the Earth. Unidentified infrared emission bands at wavelengths of 3–20 micrometres are widely observed in a range of environments in our Galaxy and in others1. Some features have been identified as the stretching and bending modes of aromatic compounds2, 3, and are commonly attributed to polycyclic aromatic hydrocarbon molecules4, 5. The central argument supporting this attribution is that single-photon excitation of the molecule can account for the unidentified infrared emission features observed in ‘cirrus’ clouds in the diffuse interstellar medium6. Of the more than 160 molecules identified in the circumstellar and interstellar environments, however, not one is a polycyclic aromatic hydrocarbon molecule. The detections of discrete and broad aliphatic spectral features suggest that the carrier of the unidentified infrared emission features cannot be a pure aromatic compound. Here we report an analysis of archival spectroscopic observations and demonstrate that the data are most consistent with the carriers being amorphous organic solids with a mixed aromatic–aliphatic structure. This structure is similar to that of the organic materials found in meteorites, as would be expected if the Solar System had inherited these organic materials from interstellar sources. Reports on the presence of hydrocarbons in igneous rocks have been on the increase and generating greater interest in the scientific community over the last 20 years. Most of the occurrences are due to the incorporation of organic material into the magmatic systems. However, reports on the presence of hydrocarbons formed by abiogenic processes have also increased in recent years, suggesting that these hydrocarbons may not be as rare as previously thought and may have implications for natural gas resources in the future. This paper reviews these occurences and the models proposed for the generation of these hydrocarbons, in particular the nature of the hydrocarbon-bearing fluids in the alkaline complexes Khibina, Lovozero and Ilímaussaq. The origin of these hydrocarbons remains controversial, whether they are (1) derived directly from the mantle, (2) formed during late crystallization stages by respeciation of a C-O-H fluid below 500°C, or (3) formed during postmagmatic alteration processes involving Fisher-Tropsch type reactions catalysed in the presence of Fe-oxides and silicates. The reports suggest that a direct mantle origin for the hydrocarbon fluid is unlikely. A model involving near-solidus reequilibration of a C-O-H fluid to a CH4-rich composition is possible, although only for extreme melt compositions that have large crystallization temperature ranges (i.e. hyperagpaitic melts). The Fischer-Tropsch synthesis of hydrocarbons in igneous rocks seems to be a more applicable model for a wide variety of igneous rocks. My belief is that oil comes not from living organic matter but produced from the primordial earth. It was then locked deep within the earth as the earths crust formed.. This theory comes from Russian scientist in the 1950’s. (Its not a new theory) Below I note the main reasons why the “Fossil fuel” theory should be refuted. 1. There is massive amounts of oil. Every time the industry says “they are running out of oil” they find more. They have been claiming that they are running out of oil for 100 years (with a big scare in the 1970’s) and as time has gone on the have always found more reserves. The oil industry itself has consistently underestimated the oil reserves especially if “recoverable reserves” are considered rather than proven reserves. “ known oil in place” is what geologist estimate is the total amount of oil that is there. For USA, it is 3 Trillion Barrels, if all oil shale’s are included, (1000 times proven reserves). The Bazhenov. field in Western Siberia, in Russia has recently been estimated to be 80 times the size the of the Green river formation in the USA the largest previous known formation. See web article below. (http://www.forbes.com/sites/christopher ... shale-oil/) For the Canadian tar sands 1.7 – 2 Trillion Barrels, a minimum of 10 times proven reserves. The Venezuelan, government claims a reserve of bitumen even greater than Alberta's, Estimated total of Canada+ Venezuelan 3 -5.4 Trillion Barrels. .
2. Initial theory of Fossil oil. When the initial theory of “Fossil oil” appeared around 1890 the scientific community did not know that the primordial earth had a atmosphere consisting of mainly Carbon Dioxide, Methane, Water vapor and Ammonia. Nor did they know that these compounds existed on the gas giants and some of their moons in our solar system. The theory was therefore by default because they could not think of any other place the oil could come from. 3. Russian oil exploitation. There are presently more than 80 oil and gas fields in the Caspian district alone which were explored and developed by applying the perspective of the abiotic theory which produce oil from the crystalline basement rock. (Krayushkin, Chebanenko et al. 1994) Crystalline basement rock forms below sedimentary rock. Clearly the oil could not form above basement rock and then seep through it. Similarly, exploration in the western Siberia cratonic-rift sedimentary basin has developed 90 petroleum fields of which 80 produce either partly or entirely from the crystalline basement. 4. Depth that oil is found. Oil is being found at depths of 30,000 feet. The deepest fossils known are from 16,000 feet. How could oil form from fossils if some oil is 14,000 feet below any of the deepest fossils. ** Vanadium is present in fossil fuel deposits such as crude oil, coal, oil shale and tar sands. There is considerable variation in concentration.. In crude oil, concentrations up to 1200 ppm have been reported. Chemical nature of Crude Oil. Crude oil is mainly hydrocarbons with very little oxygen and consists mainly of the following compounds. However Ultra Violet (UV) free radical polymerization seems quite possible with the action of UV light from the sun on the primordial atmosphere. I suspect something like below. Higher molecular weight polymers can be formed by more addition of methane / ethane and obviously for higher chain molecules (C6+) cyclic compounds. The higher the molecular weight / boiling temperature the more likely the hydrocarbon will “rain out” of the atmosphere. There are also papers describing that electrical discharge ( Lightening in atmosphere) can also polymerize methane to higher molecular weight hydrocarbons. If it can occur on Titan then it could certainly happen on the primordial earth. 7. Oil found under salt domes: Conventional theory says that oil is under salt domes because the salt was deposited through drying of lakes and seas. Fossil life was buried underneath the salt layer ( How? Why not within the salt!) then all is deeply buried. The salt being a weak rock buckled under pressure ( Yes ) forming salt domes. I think that the buckling of the salt causes cracks in the underling rock and so allows abiotic oil to come up from deep below and is trapped beneath impermeable rock / salt layer. 8. Life recycles, generally not buried in the earth. When a plant or animal dies very little is truly buried. Mostly it is re-cycled by insects, micro-organisms, fungus’s, bacteria and Actinolites. 9. How much oil have humans used? Estimates vary, Istvan Lakatos and Julianna Lakatos-Szabo of the Hungarian Academy of Sciences estimate 700 Billion barrels. John Jones in the School of Engineering, at the University of Aberdeen, UK estimate 944 Billion barrels. Today oil consumption estimated at 90 Million barrels per day. Therefore 32.5 Billion barrels per year. Therefore in 29 maximum of years this will be we will double the oil we have used. ( At no growth). 10. Economics of oil What this means is that all the oil companies have to do is to drill deeper into basement rock where there has been folding or cracking underneath so that oil seepage could occur and they are likely to find conventional oil. Although drilling deeper is more expensive it is not prohibitively so and as technology increases going deeper will be more economic. The other important issue is this. As explained above there are massive amounts of unconventional oil. The amount of money spent by oil companies on Research and Development for extracting unconventional oil will almost certainly reduce the extraction and processing costs. Shell recently estimated that it could extract shale oil at $30 a barrel and the present 2012 price is $70-$90 a barrel. The price of oil today is almost nothing to do with the cost of getting it out of the ground. The reality is that the high price is due to speculation ( World price for oil) and deliberately induced shortages both in crude oil production and refinery production.. I have read that oil could be extracted in shallow wells ( Saudi Arabia) at a profit of $5 a barrel. Even the Canadian tar sands may only require $25 per barrel. Speculation is very finicky. If it is thought there was a over abundance of oil then the “world price” could drop dramatically and conversely a shortage large price increases and we are seeing large fluctuations in price over short periods of time. The environmental cost are not in the equation for costs. For instance if climate change effects food production or global warming causes the sea level to rise the cost of coastal flooding is not considered. Green party policy. Therefore to stop using oil must be political. It cannot be economic because technology will keep the price down and present oil speculation is questionable for long term high prices. Green Party policy must be “ Stop drilling for more oil” Even if for instance they were to find a massive oil field in Canada that was “cheep oil” we cannot allow the oil companies to extract it. We need to take political stand for the future and the environment and ignore the present false economics of oil. The last thing the planet and the human race needs is more oil! Looks like a lot more publications are coming out around mass extinction events. Below are articles on ancient ocean anoxia events and other mass extinction events (moot had a video with this coverage "The Incredible Journey of Oil" http://youtu.be/cPgfnwi2m9M . Interesting that Oil and N.G. formation from ocean sources (Tethys Sea) might be different from Oil/N.G./Coal formation on ancient land masses -- particularly, if one embraces the traditional hydrocarbon formation theories. Ferns to coal -- versus mass algae/plankton to oil in the oceans. Also they don't cover the ancient sea of Panthalassa (Pacific Ocean) as a hot bed of organic plankton/die off debris. Of course, over 300 mya, there could have been several Velikovsky type planetary fly-by events with electrical/plasma effects to cause more geological/temperature changes with possible die-offs as well(?). 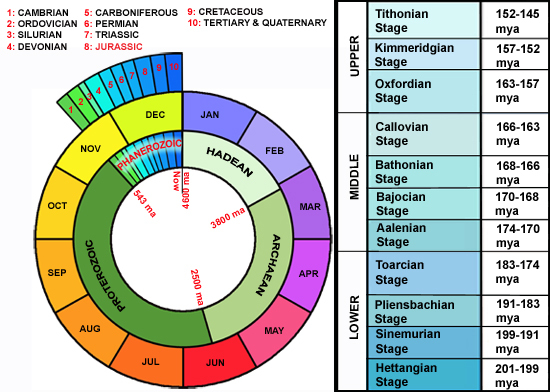 So, with all of these mass extinction events added in, the timescales stretch quite a bit to account for all of the hydrocarbon formations found around the world with the traditional models. The point on hydrocarbons with nano-diamonds found deep in the Earth, well below the fossil record, is still a "nut" they need to crack with the anoxia seas/cataclysmic die offs. End-Triassic mass extinction link to CAMP: It’s official? South Korean scientists have successfully produced gasoline using genetically engineered Escherichia coli or E. coli. The findings, published in the journal Nature, described the scientists’ novel technique where the bacterium was capable of making the liquid fuel. “The significance of this breakthrough is that you don’t have to go through another process to crack the oil created by E. coli to produce gasoline. We have succeeded in converting glucose or waste biomass directly into gasoline,” Prof. Lee Sang-yup at the Korea Advanced Institute of Science and Technology told the Wall Street Journal. The technique involved feeding E. coli glucose, which produced enzymes that converted the sugar to fatty acids. The fatty acids were than converted into hydrocarbons that resemble commercial fuel, Lee told the news outlet. “The gasoline we’re generating could be used in your car. It has identical composition and chemical properties to conventional petrol,” Lee said. This “platform” that allowed the bacterium to create biofuel can also be modified to make other products such as short-chain fatty esters and short-chain fatty alcohols. And while his team is capable of making just 580 milligrams of gasoline per liter, Lee said the breakthrough is in its early stages. “It is only the beginning of the work towards sustainable production of gasoline,” he said. “We are currently working on increasing the titre, yield and productivity of bio-gasoline. Nonetheless, we are pleased to report, for the first time, the production of gasoline through the metabolic engineering of E. coli, which we hope will serve as a basis for the metabolic engineering of microorganisms to produce fuels and chemicals from renewable resources." While gasoline and other fossil fuels have contributed to global warming, biofuels are seen as a viable alternative. But some say greener fuels might divert food crops and drive up food prices. Europe has felt the impact of crop-based biofuels. Earlier this month, the European Union Parliament voted to limit the continent’s use of biofuel since it was found to produce more emissions than fossil fuels and drove up food prices, Nature reports. The KAIST team isn’t the first to turn bacterium to biofuel. Back in April, British scientists were able to make E. coli convert sugar into an oil similar to conventional diesel. "Rather than making a replacement fuel like some biofuels, we have made a substitute fossil fuel,” Professor John Love, a synthetic biologist from the University of Exeter, told the BBC. "The idea is that car manufacturers, consumers and fuel retailers wouldn't even notice the difference - it would just become another part of the fuel production chain." In the recent catastrophe literature involving the anoxic-acidic seas of the Jurassic era, they will now need to account for the recent discovery of the Tamu Massif in the ancient sea of Panthalassa which was around the time of a magnetic reversal. This is SCIENCE FRIDAY. I'm Ira Flatow. 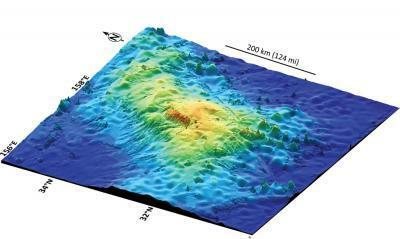 Scientists have discovered the world's largest volcano. But if you'd like to climb it, you first have to dive it because the Tamu Massif rests at the bottom of the Pacific Ocean. The volcano is so big - it's 60 times bigger than Hawaii's Mona Loa - that researchers have had to search the solar system to find a comparison and they found one on Mars, the Olympus Mons, which is the size of Arizona. In case you're worried, Tamu Massif last erupted 145 million years ago. The core samples, drilled from several locations on Tamu Massif, showed that thick lava flows (up to 75 feet thick), characterize this volcano. Seismic data from the R/V Langseth cruises revealed the structure of the volcano, confirming that the lava flows emanated from its summit and flowed hundreds of miles downhill into the adjacent basins. for example, industrial wastewater from textile or food processing plants. break-even amount of energy involved has been made as 930 kJ kg1 . biomass to a combustible product, that is, to a fuel, is also being dealt with. under the two kinds of fuels produced: gaseous and liquid. that biomass with a large water content (up to 80 mass%) can be processed . This water then constitutes the supercritical solvent and reaction medium. and phenolic products was essential for obtaining high ethanol yields . faster. No actual recovery of liquid alkane fuel, however, was discussed. mainly by Chinese and Japanese groups [21, 30–34]. was 450C, since at higher ones coke formation increased. substances and convert them to innocuous, environment-friendly products. of the process and even leave some energy for external use. Japan and the United States and also in the United Kingdom and inKorea . separation, and heat recovery, as shown in Fig. 5.2 .
. The efficiency of the process does not depend on this choice . causes mineral alterations (metasomatism) and dissolves some of them. these two solutes in HCl, NaCl, KCl, NaOH, and KOH solutions in SCW. example of such geochemical–hydrothermal processes. prealkaline and peraluminous domains in geochemical hydrous fluids . involving amino acids and other biomolecules. Rare minerals formed in the melt areas. Found in the Green River area. from an oil shale of the Green River Formation in Utah. It is now generally agreed that the term "agpaitic" should be restricted to peralkaline nepheline syenites (and phonolites) containing minerals such as eudialyte and rinkite, that is complex silicates of Zr, Ti, the rare earth elements (REE), and F and other volatiles. There are, however, cases of transition into more common types of nepheline syenites containing zircon, titanite, ilmenite, etc. The agpaitic rocks are characterized by extremely high contents of rare elements such as Li, Be, Nb, Ta, REE, Zr, Th, etc. and of volatiles, first of all F and Cl. This gives rise to a wealth of mineral species, more than 500 in the Lovozero and Khibina complexes of the Kola peninsula, about 250 in Mont Saint-Hilaire, Quebec, Canada, and about 200 in the type locality, the Ilimaussaq complex, South Greenland. These rocks have very long melting intervals and solidus temperatures as low as 500 to 400 degrees C. They are accompanied by a gas phase rich in methane and other hydrocarbons and most probably also by sodium-rich fluids as indicated by the presence of minerals such as ussingite (NaAlSi 3 O 8 .NaOH) and villiaumite (NaF) and of pegmatites and hydrothermal veins rich in sodium and rare and volatile elements. Agpaitic nepheline syenites are considered to have been formed by consolidation of melts oversaturated in alkalis, especially sodium, under conditions preventing the volatiles from escaping. These melts have been derived by extreme fractionation processes in alkali basaltic or nephelinitic magmas. About 80 miles off of the coast of Louisiana lies a mostly submerged mountain, the top of which is known as Eugene Island. The portion underwater is an eerie-looking, sloping tower jutting up from the depths of the Gulf of Mexico, with deep fissures and perpendicular faults which spontaneously spew natural gas. A significant reservoir of crude oil was discovered nearby in the late '60s, and by 1970, a platform named Eugene 330 was busily producing about 15,000 barrels a day of high-quality crude oil. By the late '80s, the platform's production had slipped to less than 4,000 barrels per day, and was considered pumped out. Done. Suddenly, in 1990, production soared back to 15,000 barrels a day, and the reserves which had been estimated at 60 million barrels in the '70s, were recalculated at 400 million barrels. Interestingly, the measured geological age of the new oil was quantifiably different than the oil pumped in the '70s. Analysis of seismic recordings revealed the presence of a "deep fault" at the base of the Eugene Island reservoir which was gushing up a river of oil from some deeper and previously unknown source. Similar results were seen at other Gulf of Mexico oil wells. Similar results were found in the Cook Inlet oil fields in Alaska. Similar results were found in oil fields in Uzbekistan. Similarly in the Middle East, where oil exploration and extraction have been underway for at least the last 20 years, known reserves have doubled. Currently there are somewhere in the neighborhood of 680 billion barrels of Middle East reserve oil. Creating that much oil would take a big pile of dead dinosaurs and fermenting prehistoric plants. Could there be another source for crude oil? An intriguing theory now permeating oil company research staffs suggests that crude oil may actually be a natural inorganic product, not a stepchild of unfathomable time and organic degradation. The theory suggests there may be huge, yet-to-be-discovered reserves of oil at depths that dwarf current world estimates. Methane (CH4) is a common molecule found in quantity throughout our solar system – huge concentrations exist at great depth in the Earth. At the mantle-crust interface, roughly 20,000 feet beneath the surface, rapidly rising streams of compressed methane-based gasses hit pockets of high temperature causing the condensation of heavier hydrocarbons. The product of this condensation is commonly known as crude oil. Some compressed methane-based gasses migrate into pockets and reservoirs we extract as "natural gas." In the geologically "cooler," more tectonically stable regions around the globe, the crude oil pools into reservoirs. In the "hotter," more volcanic and tectonically active areas, the oil and natural gas continue to condense and eventually to oxidize, producing carbon dioxide and steam, which exits from active volcanoes. Periodically, depending on variations of geology and Earth movement, oil seeps to the surface in quantity, creating the vast oil-sand deposits of Canada and Venezuela, or the continual seeps found beneath the Gulf of Mexico and Uzbekistan. Periodically, depending on variations of geology, the vast, deep pools of oil break free and replenish existing known reserves of oil. There are a number of observations across the oil-producing regions of the globe that support this theory, and the list of proponents begins with Mendelev (who created the periodic table of elements) and includes Dr.Thomas Gold (founding director of Cornell University Center for Radiophysics and Space Research) and Dr. J.F. Kenney of Gas Resources Corporations, Houston, Texas. In his 1999 book, "The Deep Hot Biosphere," Dr. Gold presents compelling evidence for inorganic oil formation. He notes that geologic structures where oil is found all correspond to "deep earth" formations, not the haphazard depositions we find with sedimentary rock, associated fossils or even current surface life. He also notes that oil extracted from varying depths from the same oil field have the same chemistry – oil chemistry does not vary as fossils vary with increasing depth. Also interesting is the fact that oil is found in huge quantities among geographic formations where assays of prehistoric life are not sufficient to produce the existing reservoirs of oil. Where then did it come from? Another interesting fact is that every oil field throughout the world has outgassing helium. Helium is so often present in oil fields that helium detectors are used as oil-prospecting tools. Helium is an inert gas known to be a fundamental product of the radiological decay or uranium and thorium, identified in quantity at great depths below the surface of the earth, 200 and more miles below. It is not found in meaningful quantities in areas that are not producing methane, oil or natural gas. It is not a member of the dozen or so common elements associated with life. It is found throughout the solar system as a thoroughly inorganic product. Even more intriguing is evidence that several oil reservoirs around the globe are refilling themselves, such as the Eugene Island reservoir – not from the sides, as would be expected from concurrent organic reservoirs, but from the bottom up. Dr. Gold strongly believes that oil is a "renewable, primordial soup continually manufactured by the Earth under ultra-hot conditions and tremendous pressures. As this substance migrates toward the surface, it is attached by bacteria, making it appear to have an organic origin dating back to the dinosaurs." Smaller oil companies and innovative teams are using this theory to justify deep oil drilling in Alaska and the Gulf of Mexico, among other locations, with some success. Dr. Kenney is on record predicting that parts of Siberia contain a deep reservoir of oil equal to or exceeding that already discovered in the Middle East. The Hydrogen-Carbon system does not spontaneously evolve hydrocarbons at pressures less than 30 Kbar, even in the most favorable environment. The H-C system evolves hydrocarbons under pressures found in the mantle of the Earth and at temperatures consistent with that environment. Deeply entrenched in our culture is the belief that at some point in the relatively near future we will see the last working pump on the last functioning oil well screech and rattle, and that will be that. The end of the Age of Oil. And unless we find another source of cheap energy, the world will rapidly become a much darker and dangerous place. If Dr. Gold and Dr. Kenney are correct, this "the end of the world as we know it" scenario simply won't happen. Think about it ... while not inexhaustible, deep Earth reserves of inorganic crude oil and commercially feasible extraction would provide the world with generations of low-cost fuel. Dr. Gold has been quoted saying that current worldwide reserves of crude oil could be off by a factor of over 100. A Hedberg Conference, sponsored by the American Association of Petroleum Geologists, was scheduled to discuss and publicly debate this issue. Papers were solicited from interested academics and professionals. The conference was scheduled to begin June 9, 2003, but was canceled at the last minute. A new date has yet to be set. Chris Bennett manages an environmental engineering division for a West Coast technology firm. He and his wife of 26 years make their home on the San Francisco Bay. This response is for Daniel E. Reynolds, 29 July 1996 on the subject of "Oil - A renewable and abiotic Fuel?" Dan, your use of the word "abiotic" is good. As a non-fossil fuel, petroleum has no living antecedent. It contains chemical elements found in living matter; but it is not "formerly living matter." There has not been enough true "formerly living matter"through all of creation to account for the volume of petroleumthat has been consumed to date. My background in this subject goes back to 1943. I was the pilot who flew a U.S. Geological Survey Team from Casablanca to Dhahran, Saudi Arabia. We met the Cal. Standard Oil team holding down that lease. Then we went back to Cairo to meet President Roosevelt during the Nov. 1943 "Cairo Conference" with Churchill and Chiang Kai Shek. FDR ordered the immediate construction of an oil refinery there for WW II use. This led to ARAMCO. During the "Energy Crisis" of the 1970's I was detailed to represent the U.S. Railroad industry as a member of the "Federal Staff Energy Seminar" program started by the Center for Strategic and International Studies, sponsored by Georgetown University. That began in Jan 1974 and continued for four years. It was designed to discuss "the working of the United States national energy system, and new horizons of energy research." Among the regular attendees were such men as Henry Kissinger and James Schlesinger...most valuable meetings. During one meeting we took a "Buffet Break" and I was seated with Arthur Kantrowitz of the AVCO Company..."Kantrowitz Labs" nearBoston. At the table with us were four young geologists busily talking about Petroleum. At one point one of them made reference to "Petroleum as organic matter, and a fossil fuel." Right out of the Rockefeller bible. Kantrowitz turned to the geologist beside him and asked, "Do you really believe that petroleum is a fossil fuel?" The man said,"Certainly" and all four of them joined in. Kantrowitz listened quietly and then said, "The deepest fossil ever found has been at about 16,000 feet below sea level; yet we are getting oil from wells drilled to 30,000 and more. How could fossil fuel get down there? If it was once living matter, it had to be on the surface. If it did turn into petroleum, at or near the surface,how could it ever get to such depths? What is heavier Oil or Water?" Water: so it would go down, not oil. Oil would be on top, if it were "organic" and "lighter." They all agreed water was heavier, and therefore if there was some crack or other open area for this "Organic matter" to go deep into the magma of Earth, water would have to go first and oil would be left nearer the surface. This is reasonable. Even if we do agree that "magma" is a "crude mixture of minerals or organic matters, in a thin pasty state" this does not make it petroleum, and if it were petroleum it would have stayed near the surface as heavier items, i.e. water seeped below. My D. Van Nostrand "Scientific Encyclopedia" says "Magma is the term for molten material. A natural, complex, liquid, high temperature, silicate solution ancestral to all igneous rocks,both intrusive and effusive. The origin of Magma is not known." My "Oxford English Dictionary" does not even have the word "Magma." All this leaves us no where. I still go with Kantrowitz. Since oil is lighter than water, everywhere on Earth, there is no way that petroleum could be an organic, fossil fuel that is created on or near the surface, and penetrate Earth ahead of water. Oil must originate far below and gradually work its way up into well-depth areas accessable to surface drilling. It comes from far below. Therefore, petroleum is not a "Fossil" fuel with a surface or near surface origin. It was made to be thought a "Fossil" fuel by the Nineteenth oil producers to create the concept that it was of limited supply and therefore extremely valuable. This fits with the "Depletion"allowance philosophical scam. During one of our C.S.I.S. "International Nights" (1978) the Common Market Energy boss, M. Montibrial of France, told us that while petroleum was being marketed then for $20.00 per barrel or more, it cost no more than 25 cents per barrel at the well-head. There is our petroleum problem! We were paying more than $1.50-$1.60 per gallon, one 42nd of a barrel, at that time. Interested folks need to learn more about the Chartered Institute of Transport, and not waste their time with OPEC, the "Cover" story. Those who pumped the Pennsylvania wells "dry" during the late eighteen hundreds saved what they had for those better days. Supercritical water (SCW) exists at pressures higher than 221 bar and temperatures above 374 °C. By treatment of biomass in supercritical water (and in the absence of added oxidants) organics are converted into fuel gases and are easily separated from the water phase by cooling to ambient temperature. The produced high-pressure (HP) gas is rich in hydrogen. The RSW (Reforming in Supercritical Water) process consists of a number of unit operation as feed pumping & pressurizing, heat exchanging, reactor, gas-liquid separators and if desired product upgrading. The reactor operating temperature is typically between 600 and 650 °C; the operating pressure is around 300 bar. A residence time of up to 2 minutes is required to achieve complete carbon conversion, depending on the feedstock. Heat exchange between the inlet and outlet streams from the reactor is essential for the process to achieve high thermal efficiency. The two-phase product stream is separated in a high-pressure gas-liquid separator (T = 25 - 300 °C), in which a significant part of the CO2 remains dissolved in the water phase. Possible contaminants like H2S, NH3 and HCl are likely captured in the water phase due to their higher solubility, and thus in-situ gas cleaning is obtained. The gas from the HP separator contains mainly the H2, CO and CH4 and part of the CO2. In a low pressure separator a second gas stream is produced containing relative large amounts of CO2, but also some combustibles. This gas can e.g. be used for process heating purposes. The RSW process is in particular suitable for the conversion of wet organic materials (moisture content 70-95%), which can be renewable or non-renewable. The focus of BTG is completely on liquid biomass streams like glycerol or the aqueous phase of pyrolysis oil. In principal, slurries should also be possible, but feeding is extremely difficult and costly. The “SuperHydrogen” project is meant to develop the Supercritical Water (SCW) Gasification process for cost-effective conversion of wet biomass and waste into clean, renewable hydrogen with an energy efficiency to pure hydrogen above 60%. The RSW process enables the conversion of especially wet biomass (~ 70 – 95 wt% moisture). The product gas is clean, rich in H2 and CH4, and available at high pressure. In a high pressure gas-liquid separator the gases are separated from the water. Due to the high pressure significant part of the CO2 is dissolved in the water phase and will be released in a low pressure gas-liquid separator. The process is now further developed and evaluated to convert aqueous by-products from pyrolysis oil upgrading into an hydrogen rich gas. In the GtM (Glycerol to Methanol) concept the production of renewable methanol from glycerol is investigated. Methanol is one of the feedstocks for biodiesel production, while glycerol is a by-product. When glycerol is converted to methanol, the methanol can be re-used in the biodiesel production process. This process makes the biodiesel proces ‘greener’, diminishes the dependency on volatile market prices, secures the supply of methanol and improves biodiesel economics. The GtM concept consists of two processes which are integrated. In the first process glycerol is converted in SCW to H2, CO, CO2, CH4 and higher hydrocarbons. The gas is separated from the water phase and in the second process this gas is converted to methanol in a packed bed reactor. Both processes are operated at a pressure of approximately 250 bar. The methanol is called supermethanol, because the syngas for the methanol is obtained in a reforming process in supercritical water. The reforming in SCW and methanol synthesis are combined in the GtM process. This is less energy intensive than compressing a gas, which is required in conventional methanol synthesis. High pressures are favourable for both the position of the equilibria and the reaction rates in methanol synthesis. In the GtM concept the conditions for methanol synthesis are such that almost complete conversion of the limiting component is obtained per pass through the reactor allowing the omission of recycle streams of unconverted syngas. Fast pyrolysis is a process in which organic materials are rapidly heated to 450 - 600 °C in the absence of air. Under these conditions, organic vapors, pyrolysis gases and charcoal are produced. The vapors are condensed to bio-oil. Typically, 60-75 wt.% of the feedstock is converted into oil. Pyrolysis offers the possibility of de-coupling (time, place and scale), easy handling of the liquids and a more consistent quality compared to any solid biomass. With fast pyrolysis a clean liquid is produced as an intermediate suitable for a wide variety of applications. BTG’s fast pyrolysis process is based on the rotating cone reactor developed by the University of Twente. Biomass particles at room temperature and hot sand particles are introduced near the bottom of the cone where the solids are mixed and transported upwards by the rotating action of the cone. In this type of reactor, rapid heating and a short gas phase residence time can be realized. The initial work of the University of Twente has been the basis for BTG to further develop the pyrolysis reactor and the overall process. Since 1993 BTG has been involved in numerous projects on fast pyrolysis. A process flow diagram of BTG’s fast pyrolysis process is given below. Biomass particles are fed near the bottom of the pyrolysis reactor together with an excess flow of hot heat carrier material such as sand, where it is being pyrolysed. The produced vapours pass through several cyclones before entering the condenser, in which the vapours are quenched by re-circulated oil. The pyrolysis reactor is integrated in a circulating sand system composed of a riser, a fluidized bed char combustor, the pyrolysis reactor, and a down-comer. In this concept, char is burned with air to provide the heat required for the pyrolysis process. Oil is the main product; non-condensable pyrolysis gases are combusted and can be used e.g. to generate additional steam. Excess heat can be used for drying the feedstock. Two test facilities are available in BTG’s lab. A small unit (2- 3 kg/hr) to enable rapid screening of potential feedstocks, and a 100 - 200 kg/hr pilot plant. The latter one provides reliable and representative data for a full scale plant. For further information please see our page on the flash pyrolysis test facility. The pilot plant has processed in total over 70 tonnes of oil for a number of clients. Due to large amounts of oxygenated components present, the oil has a polar nature and does not mix readily with hydrocarbons. The degradation products from the biomass constituents include organic acids (like formic and acetic acid), giving the oil its low pH. Water is an integral part of the single-phase chemical solution. The (hydrophilic) bio-oils have water contents of typically 15 - 35 wt.%. Typically, phase separation does occur when the water content is higher than about 30 to 45 %. Below an example of properties from typical wood-derived pyrolysis oil is given. For specific applications of pyrolysis oil see our pages on energy from pyrolysis oil, biofuels and biomaterials & chemcials. A 2 tonnes/hr fast pyrolysis plant has been designed, constructed and delivered to Malaysia. In the factory - located closely to an existing palm mill - Empty Fruit Bunches (EFB) are converted into pyrolysis oil. Usually, the wet EFB (moisture ~ 65wt%) are combusted on-site yielding only ash which can be recycled to the plantations. The palm-mill produces about 6 t/hr of this wet EFB. The EFB can be converted into pyrolysis oil using BTG’s fast pyrolysis technology. Prior to feeding it to the pyrolysis plant the EFB is further sized and dried. In a drier the moisture content is reduced down to about 5-10%. In this way, all the wet EFB from the palm is converted into approximately 1.2 t/hr pyrolysis oil. In Hengelo (the Netherlands) a 5 tonnes/hr pyrolysis plant is planned. This unit will convert wood into pyrolysis oil, process steam and electricity. For further details see the project website of the EMPYRO plant. BTG has established a daughter company BTG Bioliquids BV to further implement and commercialize the fast pyrolysis technology in close cooperation with Tree Power. An artist impression of a pyrolysis turbine is available at the website of the architect. Liquid Phase Processing (LPP) or Liquid Phase Reforming (LPR) is the treatment of organic material in the liquid phase. In case water is used as the solvent, LPR is equivalent to Aqueous Phase Reforming (APR). Schematically the process is shown in the diagram below. Typically, the process takes place at elevated pressure to keep the solvent in the liquid phase. Compared to gas phase operation higher energetic efficiencies are possible. Homogeneous or heterogeneous catalysts can be added to steer the conversion towards the desired products and lower process temperatures. In addition to the catalysts other liquid or gaseous reactants like hydrogen or carbon monoxide might be introduced. The operation window covered in BTG facilities are pressures up to 200 bar and temperatures up to 450 °C. Depending on actual operating conditions, solvent, feedstock, other reactants and catalyst a wide range of different products can be obtained. BTG is one of the partners in the European Commission (EC) funded research project SusFuelCat (http://www.susfuelcat.eu), in full ‘Sustainable fuel production by aqueous phase reforming – understanding catalysis and hydrothermal stability of carbon supported noble metals’. In the EC project BTG focuses on Aqueous Phase Processing (APP; sometimes referred to as Aqueous Reforming - APR) of biomass resources. Targeted bio-products include hydrogen or (preferably) a combination of hydrogen and alkanes. The hydrogen produced can be used either directly as a fuel, or indirectly as a feedstock in a refinery producing liquid fuel. A major characteristics and advantage of APP is the use of aqueous or water-soluble feedstock at reduced temperatures and slightly elevated pressures. Operation at such process conditions enables the processing of biomass without energy intensive drying while hydrogen can be generated in situ from biomass and in parallel from water by the Water-Gas-Shift (WGS) reaction. APP is one of the promising techniques for advanced sustainable (liquid and gaseous) biofuel production, using catalysts as a key process component. It can be applied in combination with existing conversion technologies, such as biomass pyrolysis, to convert low value biomass into high value products, including fuels, as illustrated below. Suitable feedstocks for the APR process include sugar, sugar alcohols and oxygenates derived from biomass, as well as pyrolysis oil fractions. The process versatility, the reduced energy consumption and the product flexibility address the crucial challenges of sustainable biofuel production. Therefore APR can be considered a major technology to allow rapid industrialization of sustainable fuel production in Europe. Besides its direct use in the production of biofuel, the hydrogen can also be used to upgrade biomass blends to high quality fuels or chemicals. increasing productivity, to decrease production site space requirements. In SusFuelCat ten partners (six universities and research institutions, three SMEs and one multinational company) from seven countries (Germany, Finland, The Netherlands, United Kingdom, Spain, Italy, and Russia) collaborate. Funding from the European Commission’s Seven Framework Programme (grant agreement 310490) is gratefully acknowledged. Vostrikov A. A. *, Dubov D. Yu., Psarov S. A., Sokol M.Ya. burning would occur throughout the particle. This is confirmed by our results. Scientists have found a 300-million-year-old subterranean 'fossil forest' in the US, thought to be more than 50 times bigger than anything of its kind previously discovered. Researchers uncovered the forest, which is believed to extend for up to 100 miles, encased in shale above coal seams in the state of Illinois. Complete trees, delicate ferns and even cockroach wings were fossilised during the carboniferous "coal age" after global warming caused rising water levels, which are believed to have flooded forests and choked them with sediment. The forest is entombed in eight working coal mines in depths that vary from 250ft to 800ft below ground level. Palaeontologist Dr Howard Falcon-Lang, from Royal Holloway, who explored the site, told Sky News Online: "This is the largest fossil forest ever discovered, preserved over tens of square kilometres. "It's from a time when North America and Europe lay on the equator and were covered by steamy tropical rainforests. "The fossils are spectacular and shed light on an amazing 'lost world' of the Earth's first rainforests." The compacted remains of these forests are preserved above the coal seams and built on compressed layers of peat. After the coal is extracted the fossils can be seen in the mine ceiling. "It is an amazing experience to explore these primeval forests in underground coal mines," Dr Falcon-Lang told Sky News. "The flash photography doesn't really do justice to what it is like. It's completely dark down there and we use the spotlight on our miners' headlamps to illuminate the fossils." Because of the remarkable preservation of delicate organic matter in the sediment that eventually turned to shale, scientists believe the forest was repeatedly flooded by rising water levels. Researchers have found a river as wide as the Mississippi snaking its way through the forest. Few animal fossils have been found - except for cockroach wings - as the creatures could flee the slow floods. "It is extraordinarily rare to get fossil forests of any extent at all," Denver Museum of Nature and Science paleo-botanist Kirk Johnson said. "It's usually just a few trees here and there. But here is an ancient geography - effectively unheard of." Researchers have traced a five-mile route through the forest, stopping to measure huge fossilised trees still stand rooted in their original but compacted soil, surrounded by fallen leaves. Seed ferns prevail close to the river, but further away from the ancient watercourse tree ferns and huge scale trees dominate. One fallen scale tree, measuring more than 100ft long, was traced by researchers until it disappeared into an as yet unexploited coal seam. Scientists say birds had not evolved during the era but insects grew immense in the oxygen-rich environment - with dragonflies the size of magpies and 6ft millipedes - although the vegetation was not as vulnerable to insect attack as present day foliage is. Academics hope to explore as far as possible to provide an ecosystem mapping and analysis on an unprecedented scale to help them with predictions of modern global warming. Illinois State Geological Survey team member Scott Elrick said: "With our own CO2 rises and changes in climate. "We can look at the past here and say, 'It has happened before.'" This is relatively old given that it was reported on back at the end of April, but for those who aren’t aware: A 200 million year old dinosaur fossil was discovered in Norway (their first dinosaur) after workers on an offshore oil platform pulled up a sediment core taken 1.4 miles below the sea floor! “It’s the first time a dinosaur bone has ever been found in such a deep core,” Dr Hurum told the BBC News website. “To drill through a terrestrial animal is much rarer because there are so many more marine sediments there,” Dr Hurum, assistant professor of vertebrate palaeontology at Oslo’s Natural History Museum, explained. The Integrated Ocean Drilling Program (IODP) seeks the elusive "Moho," a boundary formally known as the Mohorovicic discontinuity. It marks the division between Earth's brittle outer crust and the hotter, softer mantle. The depth of the Moho varies. This latest effort, which drilled 4,644 feet (1,416 meters) below the ocean seafloor, appears to have been 1,000 feet off to the side of where it needed to be to pierce the Moho, according to one reading of seismic data used to map the crust's varying thickness. The new hole, which took nearly eight weeks to drill, is the third deepest ever made into the floor of the sea, according to the National Science Foundation (NSF). The rock collection brought back to the surface is providing new information about the planet's composition. "It will provide important clues on how ocean crust forms," said Rodey Batiza, NSF program director for ocean drilling. Already the types of rocks recovered show that conventional interpretation of Earth's evolution are "oversimplifying many of the features of the ocean's crust," said expedition leader Jay Miller of Texas A&M University. "Each time we drill a hole, we learn that Earth's structure is more complex. Our understanding of how the Earth evolved is changing accordingly." The latest drilling was done at the Atlantis Massif, located at the intersection of the Mid-Atlantic Ridge and the Atlantis fracture zone, two plates of the planet's broken crust. The seafloor is shallower at the center of this region and therefore easier to reach. It's not clear yet whether drilling should continue at the new hole or if another one should be started in the effort the reach the mantle. Such work isn't likely to begin again in the next year, said Barbara John, a University of Wyoming geologist and one of the co-chief scientists on the expedition. "We need to evaluate all the data we have from the cruise and re-analyze the seismic data, to determine whether it's better to deepen the current hole or drill elsewhere, or maybe even collect additional seismic data to better constrain where to drill," John told LiveScience. "Our major result is that we've recovered the lower crust for the first time and have confirmed that the Earth's crust at this locality is more complicated than we thought." John said mantle material will be evident when and if it's brought up because it will have different texture and chemistry and will contain different proportions of minerals compared with rock in the crust. Drillers use the vessel JOIDES Resolution. The 10-year, $1.5 billion program is funded by the NSF and Japan's Ministry of Education, Culture, Sports, Science, and Technology. The Earth's radius is about 4,000 miles (6,400 kilometers). The main layers of its interior are in descending order: crust, mantle and core. The crust thickness averages about 18 miles (30 kilometers) under the continents, but is only about 3 miles (5 kilometers) under the oceans. It is light and brittle and can break. In fact it's fractured into more than a dozen major plates and several minor ones. It is where most earthquakes originate. The mantle is more flexible - it flows instead of fractures. It extends down to about 1,800 miles (2,900 kilometers) below the surface. The core consists of a solid inner core and a fluid outer core. The fluid contains iron, which, as it moves, generates the Earth's magnetic field. The crust and upper mantle form the lithosphere, which is broken up into several plates that float on top of the hot molten mantle below. Over forty years ago, researchers in the Soviet Union began an ambitious drilling project whose goal was to penetrate the Earth's upper crust and sample the warm, mysterious area where the crust and mantle intermingle-- the Mohorovičić discontinuity, or "Moho." So deep is this area that the Russian scientists had to invent new ways of drilling, and some of their new methods proved quite inventive. But despite the valiant effort which spanned several decades, the Russians never reached their goal, and many of the Earth's secrets were left undiscovered. The work done by the Soviets did, however, provide a plethora of information about what lies just beneath the surface, and it continues to be scientifically useful today. The project is known as the Kola Superdeep Borehole. To the surprise of the researchers, they did not find the expected transition from granite to basalt at 3-6 kilometers beneath the surface. Data had long shown that seismic waves travel significantly faster below that depth, and geologists had believed that this was due to a "basement" of basalt. Instead, the difference was discovered to be a change in the rock brought on by intense heat and pressure, or metamorphic rock. Even more surprisingly, this deep rock was found to be saturated in water which filled the cracks. Because free water should not be found at those depths, scientists theorize that the water is comprised of hydrogen and oxygen atoms which were squeezed out of the surrounding rocks due to the incredible pressure. The water was then prevented from rising to the surface because of the layer of impermeable rocks above it. Another unexpected find was a menagerie of microscopic fossils as deep as 6.7 kilometers below the surface. Twenty-four distinct species of plankton microfossils were found, and they were discovered to have carbon and nitrogen coverings rather than the typical limestone or silica. Despite the harsh environment of heat and pressure, the microscopic remains were remarkably intact. The Russian researchers were also surprised at how quickly the temperatures rose as the borehole deepened, which is the factor that ultimately halted the project's progress. Despite the scientists' efforts to combat the heat by refrigerating the drilling mud before pumping it down, at twelve kilometers the drill began to approach its maximum heat tolerance. At that depth researchers had estimated that they would encounter rocks at 100°C (212°F), but the actual temperature was about 180°C (356°F)-- much higher than anticipated. At that level of heat and pressure, the rocks began to act more like a plastic than a solid, and the hole had a tendency to flow closed whenever the drill bit was pulled out for replacement. Forward progress became impossible without some technological breakthroughs and major renovations of the equipment on hand, so drilling stopped on the SG-3 branch. If the hole had reached the initial goal of 15,000 meters, temperatures would have reached a projected 300°C (572°F). When drilling stopped in 1994, the hole was over seven miles deep (12,262 meters), making it by far the deepest hole ever drilled by humankind. The last of the cores to be plucked from from the borehole were dated to be about 2.7 billion years old, or roughly 32 million times older than Abe Vigoda. But even at that depth, the Kola project only penetrated into a fraction of the Earth's continental crust, which ranges from twenty to eighty kilometers thick. Endless scams surround Oil and NG trading apparently. Four longtime traders in the global oil market claim in a lawsuit that the prices for buying and selling crude are fixed -- and that they can prove it. Some of the world’s biggest oil companies including BP Plc (BP/), Statoil ASA (STL), and Royal Dutch Shell Plc conspired with Morgan Stanley and energy traders including Vitol Group to manipulate the closely watched spot prices for Brent crude oil for more than a decade, they allege. The North Sea benchmark is used to price more than half the world’s crude and helps determine where costs are headed for fuels including gasoline and heating oil. The case, which follows at least six other U.S. lawsuits alleging price-fixing in the Brent market, provides what appears to be the most detailed description yet of the alleged manipulations and lays out a possible road map for regulators investigating the matter. The traders who brought it -- who include a former director of the New York Mercantile Exchange, or Nymex, one of the markets where contracts for future Brent deliveries are traded - - allege they paid “artificial and anticompetitive prices” for Brent futures. They also outline attempts to manipulate prices for Russian Urals crude and cite instances when the spread between Brent and Dubai grades of crude may have been rigged. The oil companies and energy-trading houses, which include Trafigura Beheer BV and Phibro Trading LLC, submitted false and misleading information to Platts, an energy news and price publisher whose quotes are used by traders worldwide, according to the proposed class action filed Oct. 4 in Manhattan federal court. A snapshot taken from a first-principles molecular dynamics simulation of liquid methane in contact with a hydrogen-terminated diamond surface at high temperature and pressure. The spontaneous formation of longer hydrocarbons are readily found during the simulations. LIVERMORE, Calif. -- A new computational study published in the Proceedings of the National Academy of Sciences reveals how hydrocarbons may be formed from methane in deep Earth at extreme pressures and temperatures. The thermodynamic and kinetic properties of hydrocarbons at high pressures and temperatures are important for understanding carbon reservoirs and fluxes in Earth. The work provides a basis for understanding experiments that demonstrated polymerization of methane to form high hydrocarbons and earlier methane forming reactions under pressure. Hydrocarbons (molecules composed of the elements hydrogen and carbon) are the main building block of crude oil and natural gas. Hydrocarbons contribute to the global carbon cycle (one of the most important cycles of the Earth that allows for carbon to be recycled and reused throughout the biosphere and all of its organisms). The team includes colleagues at UC Davis, Lawrence Livermore National Laboratory and Shell Projects & Technology. One of the researchers, UC Davis Professor Giulia Galli, is the co-chair of the Deep Carbon Observatory's Physics and Chemistry of Deep Carbon Directorate and former LLNL researcher. 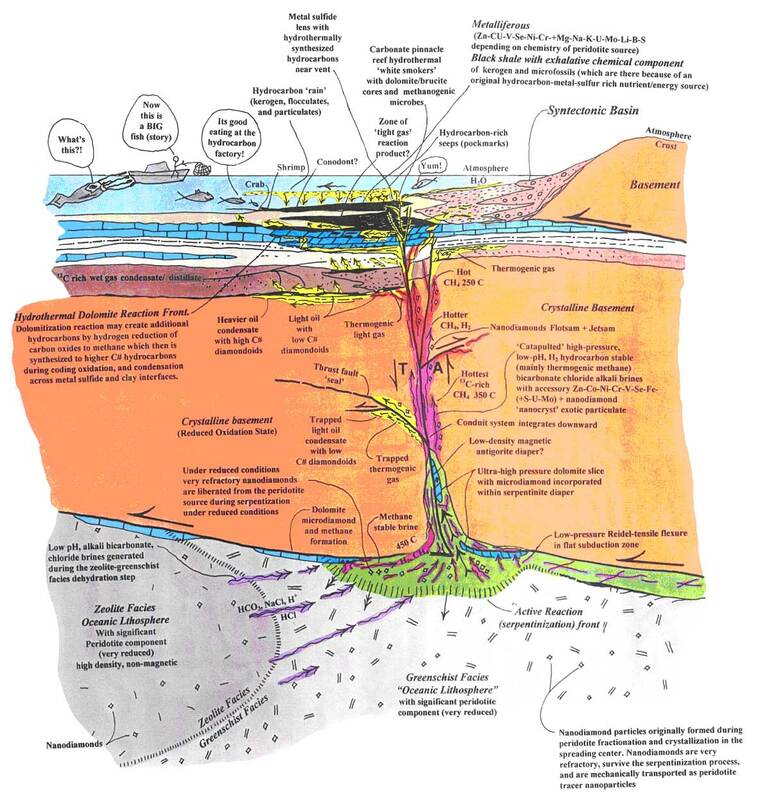 Geologists and geochemists believe that nearly all (more than 99 percent) of the hydrocarbons in commercially produced crude oil and natural gas are formed by the decomposition of the remains of living organisms, which were buried under layers of sediments in the Earth's crust, a region approximately 5-10 miles below the Earth's surface. But hydrocarbons of purely chemical deep crustal or mantle origin (abiogenic) could occur in some geologic settings, such as rifts or subduction zones said Galli, a senior author on the study. "Our simulation study shows that methane molecules fuse to form larger hydrocarbon molecules when exposed to the very high temperatures and pressures of the Earth's upper mantle," Galli said. "We don't say that higher hydrocarbons actually occur under the realistic 'dirty' Earth mantle conditions, but we say that the pressures and temperatures alone are right for it to happen. Galli and colleagues used the Mako computer cluster in Berkeley and computers at Lawrence Livermore to simulate the behavior of carbon and hydrogen atoms at the enormous pressures and temperatures found 40 to 95 miles deep inside the Earth. They used sophisticated techniques based on first principles and the computer software system Qbox, developed at UC Davis and LLNL. They found that hydrocarbons with multiple carbon atoms can form from methane, (a molecule with only one carbon and four hydrogen atoms) at temperatures greater than 1,500 K (2,240 degrees Fahrenheit) and pressures 50,000 times those at the Earth's surface (conditions found about 70 miles below the surface). "In the simulation, interactions with metal or carbon surfaces allowed the process to occur faster -- they act as 'catalysts,' " said UC Davis' Leonardo Spanu, the first author of the paper. The research does not address whether hydrocarbons formed deep in the Earth could migrate closer to the surface and contribute to oil or gas deposits. However, the study points to possible microscopic mechanisms of hydrocarbon formation under very high temperatures and pressures. Galli's co-authors on the paper are Spanu; Davide Donadio at the Max Planck Institute in Meinz, Germany; Detlef Hohl at Shell Global Solutions, Houston; and Eric Schwegler of Lawrence Livermore National Laboratory. One of the distinct geological characteristics of Lost City is that it lies upon basement rocks that originated in the Earth’s mantle and were brought to the surface through faulting. These rocks are called peridotites and consist of minerals that are rich in magnesium and iron. The most common is the mineral olivine, which consists of magnesium, ferrous iron and silica. Below temperatures of about 425°C (about 800° F), olivine is unstable in the presence of seawater and reacts to form the hydrous Mg-rich silicate mineral serpentine and an iron-oxide called magnetite. We refer to this process of hydrating mantle rocks as “serpentinization”. Serpentinization causes important changes to the physical state of the rocks and the chemical composition of the system, and produces important nutrients for microbial activity. During the formation of magnetite, part of the ferrous (Fe2+) iron in olivine is oxidized to ferric iron (Fe3+) to form magnetite. This change in the valency of iron consumes oxygen from the fluid and leads to a state that chemists call reducing conditions. As a consequence of the formation of magnetite, hydrogen gas (H2) is produced from the reduction of seawater during serpentinization. Seawater also contains carbonate ions (HCO3- or CO22-) and sulfate ions (SO42-) which can become reduced to form methane (CH4) and hydrogen sulfide (H2S) during the serpentinization process. The presence of the reduced species H2, CH4 and H2S in the fluids that seep out of the rocks provide important energy sources for different microbial species that seem to thrive around the Lost City structures. In recent years, many scientists that have studied the mid-ocean ridge system have detected the presence of elevated concentrations of methane (and in some cases hydrogen) in the water column using a CTD package similar to the one that we will be using. These chemical anomalies have been found in a number of areas, particularly along the Mid-Atlantic Ridge. In many cases, the high methane concentrations can directly be linked to the presence of mantle rocks exposed on the seafloor that are undergoing serpentinization reactions. One of the goals of our expedition to Lost City will be to combine studies of the mineralogy and chemistry of the rocks with studies of the vent fluids, water column samples, and microbiology to better understand the links between the inorganic processes in the subsurface with biological activity around the vent structures. An important characteristic of serpentinization is that the hydration reactions in the mantle rocks are exothermic – that is, they consume water and produce a significant amount of heat during the transformation of olivine to serpentine and magnetite. The amount of heat produced is directly proportional to the amount of water that is taken up to form the mineral serpentine. In fact, serpentinization consumes an average of about 300 kilograms (approximately 300 liters or 79 US gallons) of water per cubic meter of rock that is altered. At the same time, this process produces about 660,000,000 joules of heat per cubic meter of rock. In simple terms, the amount of energy produced by serpentinization of one cubic meter of rock (about 35 cubic feet) is enough to run a 100 watt light bulb for about 76 days! The geological significance of this heat effect is that serpentinization processes are capable of raising the rock temperature by about 260°C (550°F), if one ignores processes that lead to heat transport and cooling of the rock. It is this heat source that appears to be driving the Lost City hydrothermal system. This is in strong contrast to other known hydrothermal systems along the mid-ocean ridges, which are driven by magmatic heat and are characterized by high temperature, metal-rich fluids that ultimately create spectacular “Black Smoker” sulfide structures. Some of the questions that we will try to answer with our studies of the Lost City system are: How fast has serpentinization taken place at the Atlantis Massif? What are the hydrothermal temperatures today and how hot has this system been in the past? How long can serpentinization sustain hydrothermal activity in the future? Can Mountains be Built as a Result of Hydration? Another important consequence of the formation of serpentine during hydration of mantle rocks is that the density of the rocks change form about 3.3 grams per cubic centimeter (g/cm3) to about 2.7 g/cm3 and the volume of the rocks can increase up to about 40%. The change in density and the expansion of the rocks during serpentinization has the effect that the mountain becomes lighter and needs more room as it swells up, and thus “lifts” itself to greater elevations. The expansion of the rocks also leads to a greater number of cracks and ultimately causes mass wasting along steep slopes. This in turn creates new fractures that allow seawater to penetrate further into the mountain and react with new portions of rock that contain fresh olivine. Another goal of our expedition is to better understand how processes of faulting, volume expansion, and mass wasting influence the ability of seawater to alter the mantle peridotites and keep the Lost City hydrothermal system going. CORVALLIS, Ore., Nov. 18 (UPI) -- A U.S. expedition drilling into the deepest layer of the Earth's oceanic crust, just above the mantle, has found evidence of life there, researchers say. The Integrated Ocean Drilling Program sank its drill into the Atlantis Massif in the central Atlantic Ocean where seismic forces have pushed the deep layer, known as the gabbroic layer, to within 230 feet of the ocean floor making it easier to reach, NewScientist.com reported. A team from Oregon State University drilled down to 4,500 feet, where temperatures reach 215 degrees Fahrenheit. At that depth, they found widespread communities of bacteria, Stephen Giovannoni of OSU said. Many of the bacteria discovered have evolved to feed off hydrocarbons like methane and benzene, similar to the bacteria found in oil reservoirs, he said. "This deep biosphere is a very important discovery," said Rolf Pedersen of the University of Bergen in Norway. Reactions that produce oil and gas inside the crust could happen in the mantle, he says, meaning life may be thriving deeper yet. The present invention relates to a method for converting carbon dioxide into hydrocarbons by reacting magnesium with carbon dioxide to obtain magnesium oxide and carbon, reacting the carbon with hot water steam to obtain hydrogen (H2) and carbon monoxide, reacting hydrogen and carbon monoxide according to the Fischer-Tropsch method, or reacting the carbon obtained with earth alkaline metal oxide to obtain earth alkaline metal carbide and carbon monoxide, wherein the earth alkaline metal carbide is then reacted with water to obtain acetylene and earth alkaline metal hydroxide. The present invention relates to a method for conversion of carbon dioxide into hydrocarbons. Several methods are known in the art to convert carbon dioxide into several hydrocarbon materials. U.S. Pat. No. 7,605,293 B2 discloses a method of reducing the carbon dioxide content of the atmosphere by recycling carbon dioxide and producing methanol using a reductive conversion of an available source of carbon dioxide that is present in or would otherwise be discharged into the atmosphere. U.S. Pat. No. 7,596,952 B2 discloses a process for recycling carbon dioxide emissions from a fossil-fuel power plant into useful carbonated species, wherein the process comprises the steps of burning the fossil fuel, thereby generating heat and a hot exhaust gas containing carbon dioxide, and converting the heat into energy. This process is further characterized in that it comprises the steps of cooling the exhaust gas and biologically transforming the carbon dioxide contained in the cooled exhaust gas into carbonated species. U.S. Pat. No. 7,459,590 B2 discloses a method for producing methanol and dimethyl ether using the air as the sole source of materials. The method is related to producing methanol by removing water from atmospheric air, obtaining hydrogen from the removed water, obtaining carbon dioxide from atmospheric air; and converting the carbon dioxide under conditions sufficient to produce methanol. Further, U.S. Pat. No. 6,375,832 B1 discloses a method of transforming a normally gaseous composition containing at least one hydrogen source, at least one oxygen source and at least one carbon source into a normally liquid fuel, wherein said gaseous composition consists at least in part of carbon dioxide as said carbon source and said oxygen source, and of methane as said hydrogen source and as a second carbon source. One disadvantage of the methods known in the art is that, if renewable energy, such as solar or wind energy, is utilized, the methods may not work efficiently, especially if solar wind energy is fluctuating or interrupted. Also, the known methods do not have forms of process energy recovery, i.e. thermal or photonic. Additionally, these methods may consume large amounts of fresh water, which is not widely available in many parts of the world. Also, the prior art methods may require complicated process controls and very expensive process equipment. It is therefore an object of the present invention to provide a method for conversion of carbon dioxide into hydrocarbons which overcomes the difficulties and disadvantages of the prior art. The reaction between alumina and carbon in step d3) is carried out at a temperature of preferably above 2000° C., which heat can be taken from the oxygen and hydrogen combustion obtained in step d1). Further, the aluminum hydroxide obtained in step e3) can be converted into alumina by heating to a temperature of above 1000° C., which heat can for example be taken from the carbon monoxide and oxygen combustion. Further, also step d4), i.e. the reaction of beryllium oxide with carbon, is preferably carried out at a temperature of above 1500° C. Again, the required heat can be taken from reaction steps which release respective heat amounts. Methane is a political gas [just like Carbon Dioxide and Ozone] that generates significant revenue for mainstream post-normal science. Methane is a chemical compound with the chemical formula CH4 (one atom of carbon and four atoms of hydrogen). It is the simplest alkane and the main component of natural gas. The relative abundance of methane makes it an attractive fuel. However, because it is a gas at normal conditions, methane is difficult to transport from its source. Methane clathrate (CH4•5.75H2O), also called methane hydrate, hydromethane, methane ice, fire ice, natural gas hydrate, or gas hydrate, is a solid clathrate compound (more specifically, a clathrate hydrate) in which a large amount of methane is trapped within a crystal structure of water, forming a solid similar to ice. Global warming evangelists have especially demonised methane gas as a “potent greenhouse gas”. Atmospheric methane is a potent greenhouse gas (per unit, more so than carbon dioxide). The concentration of methane in Earth’s atmosphere in 1998, expressed as a mole fraction, was 1745 nmol/mol (parts per billion, ppb). By 2008, however, global methane levels, which had stayed mostly flat since 1998, had risen to 1800 nmol/mol. Unfortunately, the science of greenhouse gases [and atmospheric chemistry] is seriously compromised. Take, for example, the following [jumbled] scientific rant about methane by Wikipedia. Some gases have indirect radiative effects (whether or not they are a greenhouse gas themselves). This happens in two main ways. One way is that when they break down in the atmosphere they produce another greenhouse gas. For example methane and carbon monoxide (CO) are oxidized to give carbon dioxide (and methane oxidation also produces water vapor; that will be considered below). Methane has a number of indirect effects in addition to forming CO2. Firstly, the main chemical which destroys methane in the atmosphere is the hydroxyl radical (OH). Methane reacts with OH and so more methane means that the concentration of OH goes down. Effectively, methane increases its own atmospheric lifetime and therefore its overall radiative effect. The second effect is that the oxidation of methane can produce ozone. Thirdly, as well as making CO2 the oxidation of methane produces water; this is a major source of water vapor in the stratosphere which is otherwise very dry. CO and NMVOC also produce CO2 when they are oxidized. They remove OH from the atmosphere and this leads to higher concentrations of methane. The surprising effect of this is that the global warming potential of CO is three times that of CO2. The same process that converts NMVOC to carbon dioxide can also lead to the formation of tropospheric ozone. Halocarbons have an indirect effect because they destroy stratospheric ozone. Finally hydrogen can lead to ozone production and CH4 increases as well as producing water vapor in the stratosphere. Superficially, the Wikipedia science appears plausible. Unfortunately, atmospheric chemistry isn’t that straight forward because atmospheric molecules are continuously being broken down [into component elements and/or molecules] by photodissociation. The resultant component molecules may then [in turn] be broken down by photodissociation or they may recombine with other elements [and/or molecules] to form other molecules. These recombined molecules are then recycled through the same process by photodissociation. Thus, atmospheric chemistry is based upon the continual recycling [churning] of molecules and elements via photodissociation and recombination. Additionally, the churning mechanism is randomised because photodissociation is driven by photon absorption and recombination is determined by collision. Basically, atmospheric chemistry is a numbers game [which operates rather like a casino] where the outcome of any one event is driven by chance while collectively the outcome of many events should be statistically predictable [although this has not been demonstrated by atmospheric “science”]. With that basic understanding of atmospheric chemistry let’s return to the demon methane and look at the methane oxidation cycle that humans have constructed from the random churning in the atmosphere. Figure 6: Schematic of the CH4 oxidation cycle (from Wayne, 1991). The bold arrows in the first half of the cycle indicate what happens without NOx, while the thin arrows on the second half indicate processes that require NOx, and close the loop back to the formation of hydroxyl. In summary, NOx plays a very important role in the methane oxidation cycle. If it is sufficiently abundant, it closes the loop of a cycle that regenerates hydroxyl. In its absence, the cycle terminates abruptly and methane becomes a sink for hydroxyl. Roughly 70 per cent of the OH reacts with CO, and 30 per cent with CH4, in the unpolluted atmosphere. Strangely, the initial Wikipedia claim that “methane and carbon monoxide (CO) are oxidized to give carbon dioxide” is not directly supported by the methane oxidation schematic. However, with a bit of cherry picking and conjuring from the churning soup of atmospheric chemistry it is probably possible to construct some chain of events that connects methane to carbon dioxide. However, this is really a red herring because the level of OH in the atmosphere is primarily determined by the level of water vapour in the atmosphere because the photodissociation of H2O produces O and OH. Intriguing, the inconvenient photodissociation of water vapour in the Earth’s atmosphere has become very unfashionable with post-normal science because it disrupts their carefully constructed settled science regarding ozone, carbon dioxide and methane. Thus, Wikipedia has banished the photodissociation of water vapour [and methane] from Earth and confined the process to the “interstellar medium”. Next up from Wikipedia we have: “the oxidation of methane can produce ozone”. Unsurprisingly, the methane oxidation schematic shows the exact opposite because the diagram associates the production of OH with the photodissociation [destruction] of O3 [ozone]. However, [again] with a bit of cherry picking and conjuring from the churning soup of atmospheric chemistry it is probably possible to construct some chain of events that connects methane to ozone production. Although, it is just as possible that Wikipedia really means destroys when it says “produce” because the mainstream has a problem with ozone depletion [but that’s another sad story for another day]. Wikipedia then follows up with “the oxidation of methane produces water”. This [surprisingly] is a correct statement supported by the methane oxidation schematic. However, [unsurprisingly] this is really only a problem for the believers in global warming because water vapour in the atmosphere has a nasty habit of forming clouds which have a devious tendency to block incoming solar radiation and, thus, fiendishly cools the Earth’s surface. This is really a gem of twisting, turning and circular logic which appears to be demonizing the evil hydrogen without directly mentioning the [banished] photodissociation of H2O into H and OH. Indeed, the photodissociation of water molecules liberates hydrogen atoms which may then recombine [possibly after forming H2] with a single carbon atom [possibly liberated by the photodissociation of CO or CO2 (such irony)] to form methane [CH4]. However, the subsequent oxidation [of the thus formed methane] neutralises the process because the oxidation of methane is associated with the production of water [as correctly stated by Wikipedia]. The subsequent photodissociation of the liberated OH will liberate O and H atoms. The liberated H atom may [or may not] join the CH4 recombination party. The liberated O atom may [or may not] join the O3 recombination party. Overall, the settled science presented by Wikipedia indicates that methane is not an indictable indirect greenhouse gas because the oxidation of methane produces water vapour which forms clouds that prevent incoming solar radiation from warming the surface of the Earth. One of the dodges employed by the mainstream is to combine [old fashioned] oxidation with [old fashioned] combustion into a [far more fashionable] definition: Redox reactions. Redox (reduction-oxidation) reactions include all chemical reactions in which atoms have their oxidation state changed; redox reactions generally involve the transfer of electrons between species. Thus, when an [modern] “environmentalists” refers to methane oxidation they may actually be referring to methane combustion [or vice versa]. Wikipedia [very helpfully] provides an overview of “part of the process” they have bolted together for methane combustion. a) Only one of the equations [see 4 above] produces a molecule of H2O. b) None of the equations produce any CO2. The claimed chain of events, therefore, probably follows the CH3 molecule that is produced by all five of CH4 oxidation reactions [see 1,2,3,4 and 6 above]. However, CH3 is “highly reactive and rarely observed” and the likelihood is that the CH3 molecule will react with the first random molecule [or element] that it bumps into. A methyl group is an alkyl derived from methane, containing one carbon atom bonded to three hydrogen atoms — CH3. The group is often abbreviated Me. Such hydrocarbon groups occur in many organic compounds. While the methyl group is usually part of a larger molecule, it can be found on its own in either of three forms: anion, cation or radical. The anion has eight valence electrons, the radical seven and the cation six. All three forms are highly reactive and rarely observed. The Rabbett Run blog has constructed a chain of events that links CH4 to one molecule of CO2 [via CH3]. i) May rarely occur given the reactive nature of CH3 and the availability of other atoms and molecules in the atmosphere i.e. it may be possible but there is no guarantee that it is even probable. ii) May be broken at any point by random photodissociation, recombination, ionization, electron capture, combustion and collision with another atom / molecule / particle [that is not in the involved in the defined event chain]. iii) Does not have the claimed “end result” because atmospheric chemistry is a continuous process [it never stops] and the claimed “end result” is instantly subject to random photodissociation, recombination, ionization, electron capture, combustion and collision with another atom / molecule / particle. iv) Is a human construct that does not accurately reflect reality because “event chains” are not preordained and they are not executed in isolation in the atmosphere. There is a really delicious irony [tucked away in the Methane section of Wikipedia] that claims that naturally occurring methane is mainly produced biologically by a chemical reaction that converts CO2 into CH4 and water [with some help from ionised hydrogen and some electrons]. Thus, it appears, the biosphere is busy converting CO2 into CH4 so mankind can burn the methane gas and, thereby, convert the CH4 back into CO2. This appears to be a very sustainable natural cycle which is very beneficial to mankind because we can use the energy from combustion and enjoy the water liberated by both chemical reactions. I am sure the “environmentalists” are just going to hate the concept. neon or argon, but it does apply to CO2.